Google is going to be a web based file storage system. Although Google are tight lipped about it, but there is a buzz that Google will soon release an online hard drive that will let folks store all their personal documents up in the network cloud. Your music, photos, videos, and office documents could be uploaded to Google's hard drive and would then be available on any computer with Internet access. This is probably the year of Google's most important product launches. Even if they're much rarer than last year, they are strategically important (personalization, universal search, machine translation, the mobile platform, social gadgets). 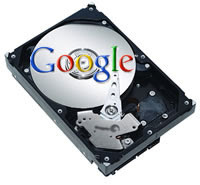 Google already offers free e-mail and other services where users can store data. In a statement, Google said, "Cloud computing is going mainstream. The apps people use every day, such as e-mail, photo sharing, and word processing, are moving to the Web because it's easier to share and access your data from anywhere when it's online, in one place.